The pycnogonids (or sea spiders) are an enigmatic group of arthropods, classified in recent phylogenies as a sister-group of either euchelicerates (horseshoe crabs and arachnids), or all other extant arthropods. Because of their bizarre morpho-anatomy, homologies with other arthropod taxa have been difficult to assess. We review the main morphology-based hypotheses of correspondence between anterior segments of pycnogonids, arachnids and mandibulates. In an attempt to provide new relevant data to these controversial issues, we performed a PCR survey of Hox genes in two pycnogonid species, Endeis spinosa and Nymphon gracile, from which we could recover nine and six Hox genes, respectively. Phylogenetic analyses allowed to identify their orthology relationships. The Deformed gene from E. spinosa and the abdominal-A gene from N. gracile exhibit unusual sequence divergence in their homeodomains, which, in the latter case, may be correlated with the extreme reduction of the posterior region in pycnogonids. 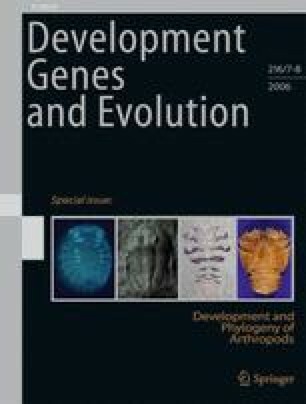 Expression patterns of two Hox genes (labial and Deformed) in the E. spinosa protonymphon larva are discussed. The anterior boundaries of their expression domains favour homology between sea spider chelifores, euchelicerates chelicerae and mandibulate (first) antennae, in contradistinction with previously proposed alternative schemes such as the protocerebral identity of sea spider chelifores or the absence of a deutocerebrum in chelicerates. In addition, while anatomical and embryological evidences suggest the possibility that the ovigers of sea spiders could be a duplicated pair of pedipalps, the Hox data support them as modified anterior walking legs, consistent with the classical views. Supplementary material is available for this article at http://dx.doi.org/10.1007/s00427-006-0095-2 and is accessible for authorized users. We thank the Station Biologique de Roscoff for providing lab facilities for specimen collection and preparation. We are grateful to Jean Deutsch, Eric Quéinnec and Nicolas Rabet for advice and discussion, to Pierrette Lamarre for technical help, and to Thierry Jafredo for lab facilities. This work was founded by CNRS and the French Ministry of Research.